At the beginning of each month, C&I Studio’s, located in the Arts District of Fort Lauderdale, hosts a gaming event called First Friday. Each event has a different theme. December’s event will include Karaoke hosted by DJ Anim8ted of Non-Stop Karaoke of Florida. 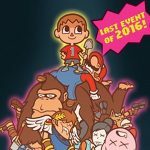 This monthly event caters to gaming and anime fans. There’s also full service bar, free play gaming stations, tournaments and door prizes. Don’t miss out on the last First Friday of 2016! Gaming tournaments, hype munchies, booze, and much more. Stay tuned on their facebook page for upcoming announcements! $5 Entry. Double Elim, EVO 2016 Rules set. 60/30/10 payout for 1st, 2nd, and 3rd place. 1st place will also win a Smash Bros. Champion Belt (yup) and 2 Weekend Passes to Paradise City Comic Con December 9th-11th! Back by popular demand, Karaoke w/ DJ Anim8ted will be in full effect for our last event of the year! Grab some liquid encouragement from the bar, take the stage and wow the crowd. Calling all cosplayers! Headed to Paradise City Comic Con? Well test out your cosplay at First Friday! 1st place wins a photoshoot with C&I Studios LIVE during the event! Check in starts at 8:30pm, Line up start at 9:30pm. Judges TBA.